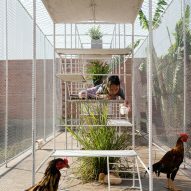 Vietnamese studio Tropical Space has created an elaborate coop that features a network of boxes, platforms and stairs, which can be used by both chickens and children. The coop was commissioned by an elderly couple who wanted to move to the country side and keep chickens. They also wanted their grandchildren to come and visit often, and needed a space for them to play when they came to stay. 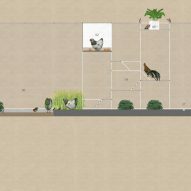 The 20-square metre square chicken coop has a narrow rectangular plan that measures ten metres long and two metres wide. It is two metres high so that it is large enough to accomodate children and chickens. Located in the grounds of the couple's house in the Duc Hoa District in Vietnam's Long An Province, the coop is constructed from steel reinforcing bars and chain link fencing. Inside the coop a network of boxes and platforms connected by lightweight stairs provides entertainment for the chickens and children, who are able to climb, clamber and chase each other. 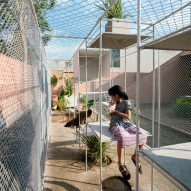 "The design team does not want to imprison the chickens in small cages. 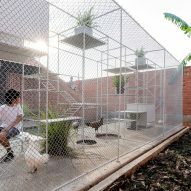 The chickens also need free space, air, a place to drink water, lay and hatch eggs," explained Tropical Space. 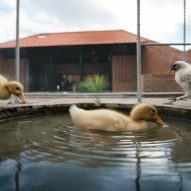 "We want to give them a large and safe space to form a miniature social community for chickens and ducks." 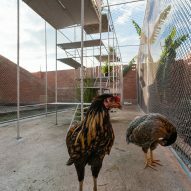 The metal grill that surrounds the coop was chosen as it provides a seamless connection to the outside space while keeping the chickens safe. 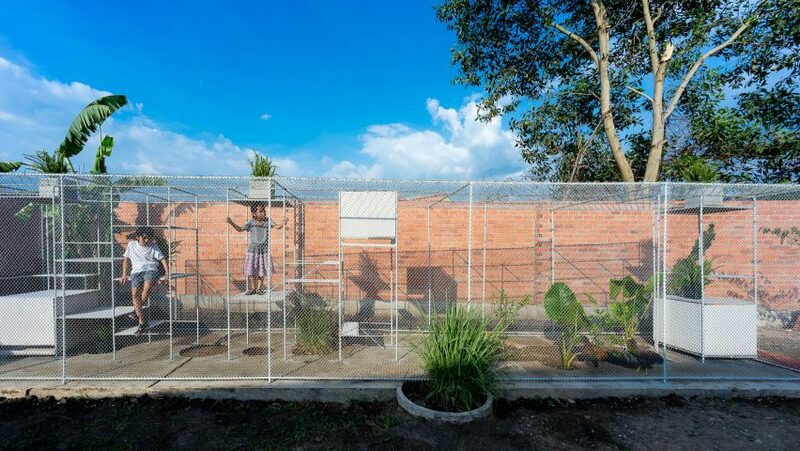 "Around the cages, the owner will grow vegetables and luffa which can climb up and cover the roof to create the shade for the chicken coop," said the design team. 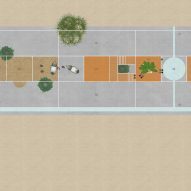 "In terms of cleaning the coop, all water and chicken waste will drain to the sides of the garden to irrigate vegetables." The studio hopes that the coop will provide a place for the children to relax outside of the city while providing a engaging pastime for the elderly couple. 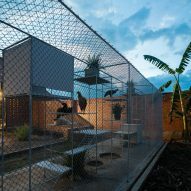 "When we finished the chicken house, we realised that sometimes humans also need to relax in order to have the freedom as chickens," they said. "The simple things make life more beautiful and lovely." Other architectural chicken coops include this metal-clad bunker featuring wooden nesting boxes and underfloor heating by Architecture Research Office, and this blackened timber-clad coop called Breed and Retreat by Dutch designer Frederik Roijé.